Take an honest look at your financial responsibilities. Calculate what it’ll mean to be without a paycheck for an unknown amount of time, particularly if there are people depending on you. You might be unemployed for weeks, months or even longer. Figure out in advance how far your bank account can stretch. What stage of life are you in? Are you willing to learn new skills and get retrained? Ageism in the workforce is real. It’s harder to get a job in your 50’s and 60’s than in your 30’s or 40’s. That’s not to say, this should stop you. It didn’t stop me. I’m the living proof that career reinvention is possible even at 60. If you’re sure you want to quit your job, it can be tempting to exit with righteous indignation on the spot. (I’ve entertained that notion a couple of times.) But it’s way more advantageous to leave on good terms. And if possible, it’s smart to have your exit be part of a thought-out strategy. From my experience with many clients, even knowing there’s light at the end of the tunnel, can help you endure those remaining, challenging days on the job. Your performance is being sabotaged because of a toxic work culture, whether it’s your supervisor or colleagues. It makes sense that you’re miserable. If the toxicity is systemic and there’s no one at the company to set things right, get out of harms way and move on. You’re in a high-stress job that provides you with no work/life balance and it’s taking an emotional and physical toll. Before you bolt, ask yourself this question: “Am I enabling the situation by not creating strong enough boundaries?” If the answer is no, start shopping your resume. You’ve been in your job for a long time and you’re burnt out, with nothing left to give. Consider this – have you been using all your sick days? Would a beach vacation help? If you’re really at the end of your rope and the work is suffering, create a plan to move on. You were hired for a particular set of skills, let’s say—creative marketing, and your job morphs into data analysis because that’s what the company needs, but you hate number crunching and now you’re doing lousy in performance reviews. 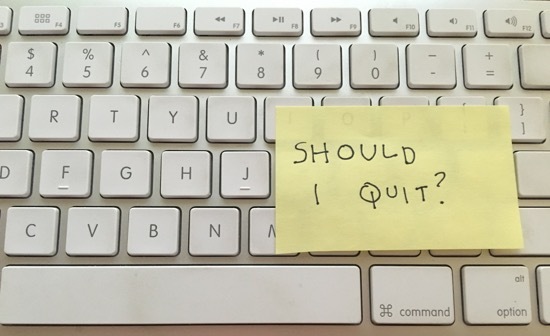 One suggestion prior to quitting – Can you be candid with your boss about the situation? Is there another team within the company to relocate? You’ve stopped growing in your job and there’s no opportunity for advancement. If you’re in a later phase of your professional life, maybe you can hang in there and seek fulfillment off the job, through volunteering, political activism or avocational artistic outlets. But if you’re longing for a sense of purpose at work and are willing to do what it takes (including taking a risk) now’s the time to go after your dream. And if you’d like to schedule a complimentary, introductory session, please get in touch.